Add storage to your home office with the two drawer lateral file. The top drawer features a simple, standard utility drawer, while the bottom features a locking file drawer that perfectly holds letter and legal size. 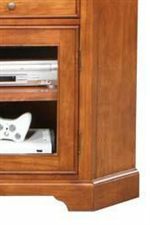 A transitional design features clean, straight lines, simple knobs, bracket feet and top and bottom moulding. The Topaz 16" Two Drawer File by Winners Only at Crowley Furniture & Mattress in the Kansas City Area: Liberty and Lee's Summit, MO & Overland Park, KS area. Product availability may vary. Contact us for the most current availability on this product. Storage 1 Utility Drawer, 1 Locking File Drawer for Letter and Legal size. The Topaz collection is a great option if you are looking for Casual furniture in the Kansas City Area: Liberty and Lee's Summit, MO & Overland Park, KS area. Browse other items in the Topaz collection from Crowley Furniture & Mattress in the Kansas City Area: Liberty and Lee's Summit, MO & Overland Park, KS area.